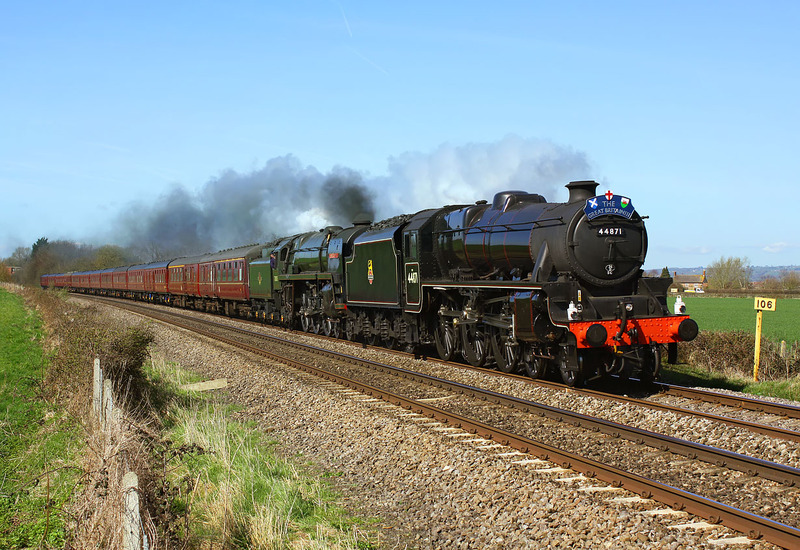 'Black Five' 4-6-0 44871 & BR 7P 4-6-2 70000 Britannia pass Gossington on 8 April 2010 with the Railway Touring Company 1Z86 10:06 Bristol Temple Meads to Preston 'Great Britain III' railtour. This was day three of a massive nine day itinerary, literally traveling from one end of the country to the other. Given the fact that this is one of the few locations where the sun is on the front at this time of day, I was astonished to find that I was the only photographer at this reasonably well known footpath crossing! I know a lot of photographers don't like walking even a short distance from their cars, but the main road is only a short distance away by the bridge in the background.